even as it dangles down in pain. supports your tilted head above his angled knee. the feathers soft and real. They ruffle in the late-night breeze. “Dear Wounded Saint” by Abigail Carroll appears in A Gathering of Larks: Letters to Saint Francis from a Modern-Day Pilgrim (Eerdmans, 2017) and is used by permission of the publisher. 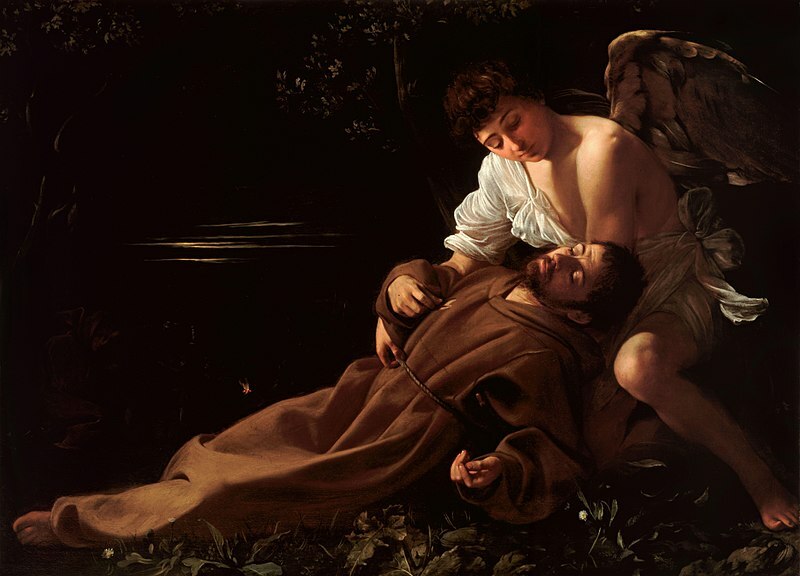 Caravaggio: Saint Francis of Assisi in Ecstasy, ca. 1595. Oil on canvas, 92.5 × 127.8 cm. Wadsworth Atheneum, Hartford, Connecticut, USA. Michelangelo Merisi da Caravaggio (1571–1610) was an Italian painter known for combining physical and psychological realism with a dramatic use of light and shadow (a technique known as tenebrism). One of the progenitors of Baroque painting, he executed many large-scale religious works throughout his career, including The Calling of Saint Matthew, The Beheading of Saint John the Baptist, The Supper at Emmaus, and The Incredulity of Saint Thomas. Saint Francis of Assisi in Ecstasy is one of his earliest paintings; it shows Francis being supported by an angel after just having received an awesome vision of the crucified Christ followed by the stigmata (five wounds) unto his own body. Abigail Carroll is an American author, poet, and pastor of arts and spiritual formation living in Vermont. She has published two volumes of poetry: Habitation of Wonder (Wipf & Stock, 2018) and A Gathering of Larks: Letters to Saint Francis from a Modern-Day Pilgrim (Eerdmans, 2017). In addition, her poems have appeared in Sarah Arthur’s devotional compilation Between Midnight and Dawn: A Literary Guide to Prayer for Lent, Holy Week, and Eastertide (Paraclete Press, 2016) and in publications such as the Anglican Theological Review, the Christian Century, Midwest Quarterly, Spiritus, and Sojourners. Visit her at http://abigail-carroll.com/.